Harley came to live with Michael, Hennie, Amanda, and Helen, in the spring of 1995. We think he must have been born about Valentine's day. He died ten years later, February 23, 2005. He was a courageous dog with a golden heart. He loved us and trusted us, and we all loved him. He had a good life and he enriched all of our lives. Like the rest of us in this family, he was good-hearted, a bit adventurous, very independent-minded, and fun-loving. On this web page Hennie and I have recorded some of our memories of Harley. If ever a dog deserved dog heaven, it was Harley. Hennie: The first time we saw him--he was in the middle of Huntington Drive, running around in the middle of the road, a tiny little puppy. I was on the way to the beach with my parents, who had just arrived from Holland. I tried to avoid the dog, but my mother said, "You can't leave him there! You have to take him home and put up signs." So I did that instead of going to the beach. When Michael came home and saw the dog, he had the biggest smile. My mother elbowed me and pointed to his face. We made Found Dog signs and put them up. Amanda had him on a rope leash and ran ahead, and Harley ran behind her with his big flopping feet, and Helen ran behind him. We knocked on doors. Michael: I was hoping nobody would claim him. You could see by his big feet that he would be a big dog. Hennie: So there we were with the dog. Amanda gave him the name "Harley". Michael: He went behind the couch and fell asleep, and we thought he was lost, and we looked all over for him. Hennie's father was very sad and pessimistic. Then he turned out to have been behind the couch asleep the whole time! He was a lot of trouble as a puppy! Hennie: One time when I came home from school he had a double strip of wicker around his neck. He had chewed up the laundry basket from the Montessori School. Another time he had a big broad blue thing hanging out of his face. It was the cover of the unabridged dictionary! And didn't he chew up a phone? Hennie: Once Helen and I came into the living room and he was standing on top of the dining table, eating leftovers. Hennie: Once Helen and I went walking in the creek in the summer. Harley walked along with us, spluttering here and there. Hennie: When he was two or three he really liked puppies. There were some puppies he would often see at the beach. He was so kind to them. Their people called him "Uncle Harley". Michael: They called him the "Gentle Giant". Hennie: We took him to Clear Lake in the fall, that same year we got him. He rode in our old Dodge Colt between the girls. Michael: He was already so big that his head stuck into the front seat. Hennie: I saw him swimming there, in the lake. That's the only time I ever saw him swimming. Hennie: I took him to the Polo Field many times before it was a park. We walked around the loop road. We would pick up Jules [a friend's dog] on the way and Jules would walk halfway around with us. Michael: He was a frequent fugitive in his first two or three years. I would get calls from people from miles around. I got a call from Glaum's egg farm two hills away--We've got your dog! 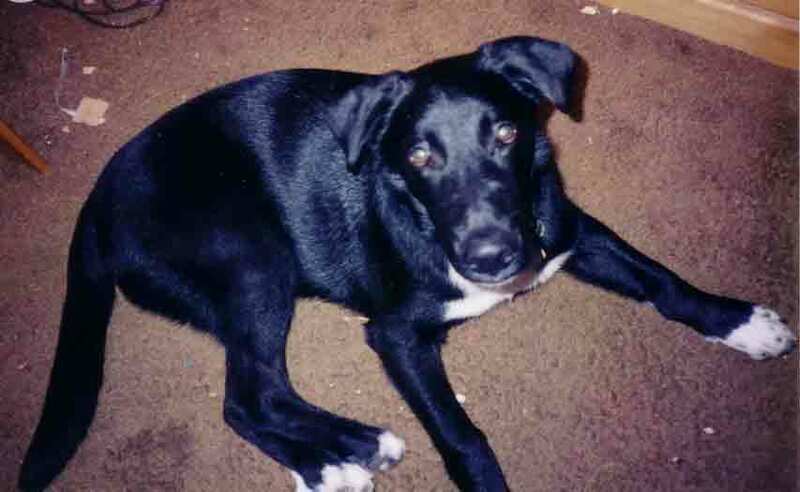 I got a call from some church a mile beyond Freedom Boulevard--we've got your dog! Somehow he had crossed the busy Freedom Boulevard alive. I got many calls from the local junior high school--Harley discovered that at 7:30 am there were hundreds of kids there to play with. It's about a mile away. I knew the secretary by name. Hennie: So often I would come home, and he would sit there, "Is it my turn yet?" If I had bags on my shoulder he would know he wasn't going for a walk, but if I put my hiking boots on, he would jump up and run around in circles. I would come home and say, "Oh, you want to go. I know". He knew the word "go" and he wouldn't even give me time to get my shoes tied, he'd be pressing on my legs and urging me to go. Hennie: If I was baking, he'd sniff it all the way from his doghouse, and come jingling down the path to see if there was something for him. Michael: I remember when I built his doghouse. He wanted to be outside, so I built him a doghouse. I built the frame out of two by twos and he watched me doing it for a long time, tilting his head so quizzically. You could just see the wheels grinding--what the heck is he doing? Finally the walls were together and I invited him in. The light bulb went on over his head. I told him "This is your house, Harley" and I swear he understood. He licked my hand as if to say "Thanks!" 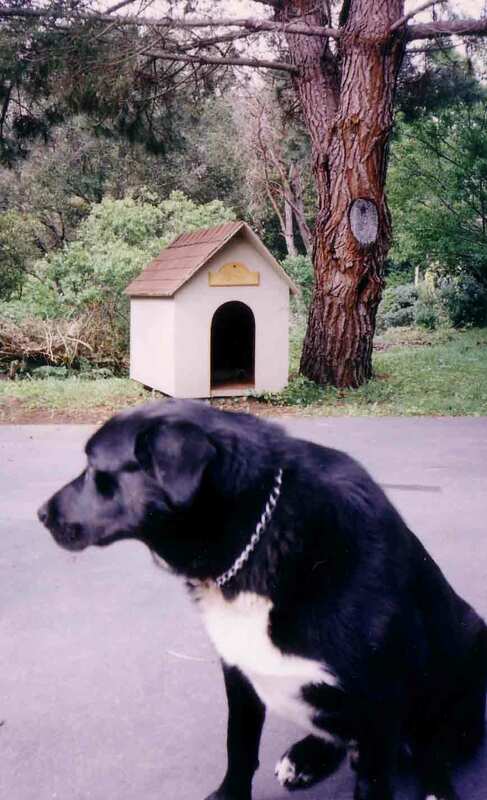 He slept in that doghouse almost every night until the last week of his life. He refused to stay inside, even in the worst weather. The doghouse was pretty warm and dry, thanks to the heating pad under the carpet on top of the foam mattress, and its overhanging, tarpaper-and-shingled roof. Helen was eleven when she used a woodburning tool to write "Harley" on a fancy nameplate that still hangs over his doghouse. Hennie: He had "caves" that he dug himself under the bushes, to make himself cool places. Francisco sometimes tried to fill them in to no avail. Now they'll be growing over. Hennie: If I came out in the morning having three bags over my shoulders, he would sometimes roll over on his back with all four feet in the air to get his tummy rubbed. I would say, "OK, OK" and pet his tummy first. Hennie: In the beginning he would bark at the deer and chase them away. But he's been too sedentary in the last years. Hennie: I was so happy to see him when I came home every day! I would say, Hi, Harley!. Now I'm not ever going to say that again. Then he would come for his dinner, and after dinner he would bark once for his pig ear, and then for his peanut-butter biscuits. I'll miss him every day when I come home. I would look for him every day and check out where he was, "Oh, the dog is on the deck". When I had a little grease in the bottom of the pan, I would think "Harley would like that." At Thanksgiving I would bring home the turkey skins for him. Hennie: His arthritis has been so bad the last years. First he couldn't go to the Polo Field any more. Then he could only go down the path towards Shriya's. Then he couldn't go up the foresty part at the end. Sometimes he would say "I can't go", but if we both went he would always go. He would look over his shoulder to see if the other one was really coming. Just like today, right up to the last minute. Michael: In the car on the way to his death, without an ounce of strength left, Hennie went back for some forgotten thing, and Harley lifted up his head, worried whether she was coming. Hennie: I'll never forget him. He lives on in our memories. Hennie: Once he had some health problem and had to wear an Elizabethan collar for a while. Oh, he hated that silly thing! Michael: I remember how we gave him baths. We used the outside shower by the hot tub. He hated baths and you had to pull him by a chain around the neck down to the shower. There was a hose attached through which we got hot water. Hennie and I usually did this together; shampooing him down and rinsing him off. He would submit after an initial struggle, but if you didn't keep the leash tight, he'd make a break for it. Afterwards, he knew the routine: get toweled off and then wait in the fenced deck area by the hot tub until he was pretty dry. Since he was an outside dog, this only happened three or four times a year, if that. Hennie: Once the UPS man brought a big box of Christmas presents from John, Debra, Chris, and Amy. Harley opened it and ate all the chocolates. We found the evidence when we got home. Here's a picture of him with a real Christmas present of his own. When he was young, he could climb over the seat and try to get in the front seat. 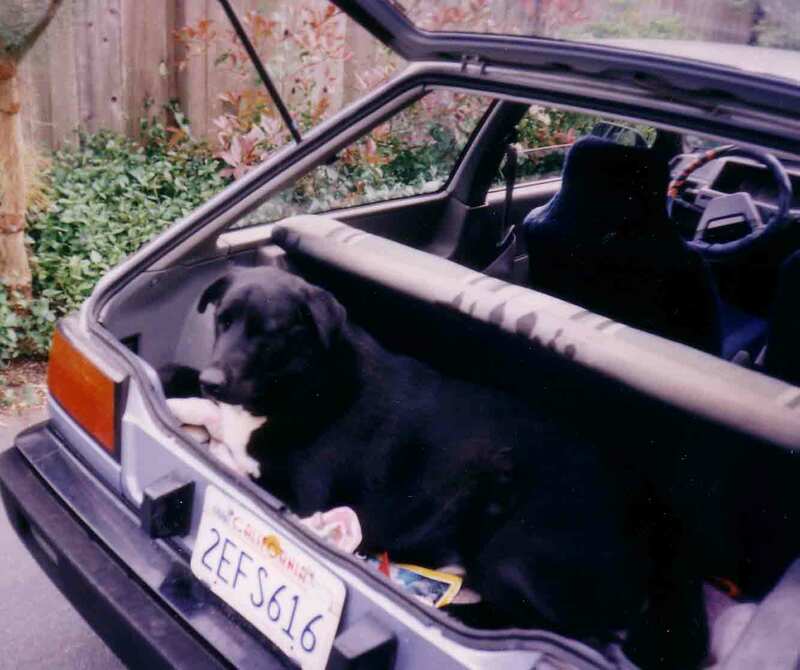 We used to leave part of his leash hanging out of the car so it would be caught in the door and prevent him climbing over the seat. Michael: Harley hated the sound of Hennie's flute. When she played, he would howl and ask to go out. Even if he were outside on the deck, he would howl in complaint. But he liked the piano, and sometimes he would sing with me. I would sing "He's my good dog, Harley", and he would wag his tail or chew his front paw as he always did when you petted him. But with a little encouragement he would sometimes really sing along, howling not too tunefully, but really trying to sing, not complaining. He was always interested in whatever the people did. Here he is helping Amanda paint. Was he trying to drink the paint water? Hennie: He loved his friend Fletcher. He would go to the top of the driveway and call "Arooo" and Fletcher would hear and come trotting down the road. 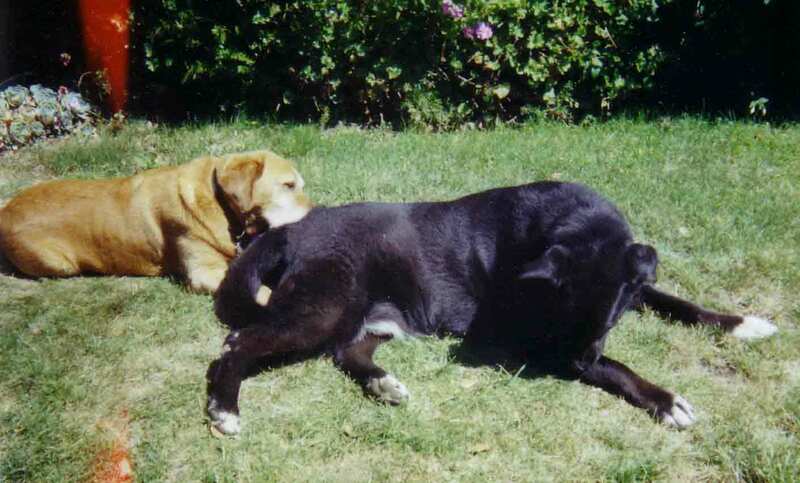 Fletcher would lick Harley's fur on his lower back until it stood on end. This "massage" may have been somehow therapeutic. He knew the name "Fletcher". Fletcher would come to our door to beg a biscuit, and if you spoke his name Harley would perk up. Here's the one and only photo we have of Harley and his best canine friend ever. Michael: At Fletcher's memorial service we learned that Harley and Fletcher used to make the rounds of the entire neighborhood together every day, begging from every house. And of course, they got something at almost every house! No wonder Harley was overweight. (And so was Fletcher.) Then Fletcher died, and there was no way to tell Harley what had happened. He was mystified for a while and then one night, he howled and howled out his heart's grief for what was for him the sudden and mysterious disappearance of his friend. Hennie: I remember that after Fletcher died I took Harley to the Polo Field a few times and he would try to turn down Fletcher's driveway. So he didn't understand that Fletcher was gone for good. Hennie: Many times on the way home I thought "Oh good, my dog is waiting for me, I get to walk my doggie.". Michael: She took him for a short walk almost every day. Often, when she would get home late, she would walk him anyway, even though it was dark. He loved to go walking with her and she loved to go walking with him. I loved it too in the daytime. Michael: It was Harley's job was to keep things in order on the property at night. Occasionally he was over-diligent. I remember one time he was barking and barking. I went out and found him under the bedroom, where he had cornered an opossum. The opossum couldn't get away, but Harley was afraid to get very close to it. I solved this problem by holding Harley's collar and squirting the opossum with a garden hose. He took off pretty fast and I'll bet he never came back. 1996 Don and Carleen departed in the morning. I had to return after dropping off Amanda and retrieve Harley who had followed Don off the property. Harley is taking antibiotics for his chewed-up forepaws. Sa 10.9.96 Harley's electric fence or collar is out of order, buzzing and shocking too far from the fence, if turned sideways. Fence is turned down as far as it goes, unless the switch is malfunctioning. 11.12.96 Had to go get Harley from Aptos Junior High. There he "nipped" Ed the janitor by accident, while rolling over to get his tummy rubbed his tooth struck Ed's hand. I had to leave my phone number. Ed didn't seem in the mood to sue, and he understood that Harley was friendly, but he did intend to get a tetanus booster. I tied Harley up for the rest of the day. A seventh-grader filled me in on what happened: Ed was leaning down to rub Harley's exposed tummy and Harley's head accidentally nicked Ed's hand. The kid said, "he had velocity." 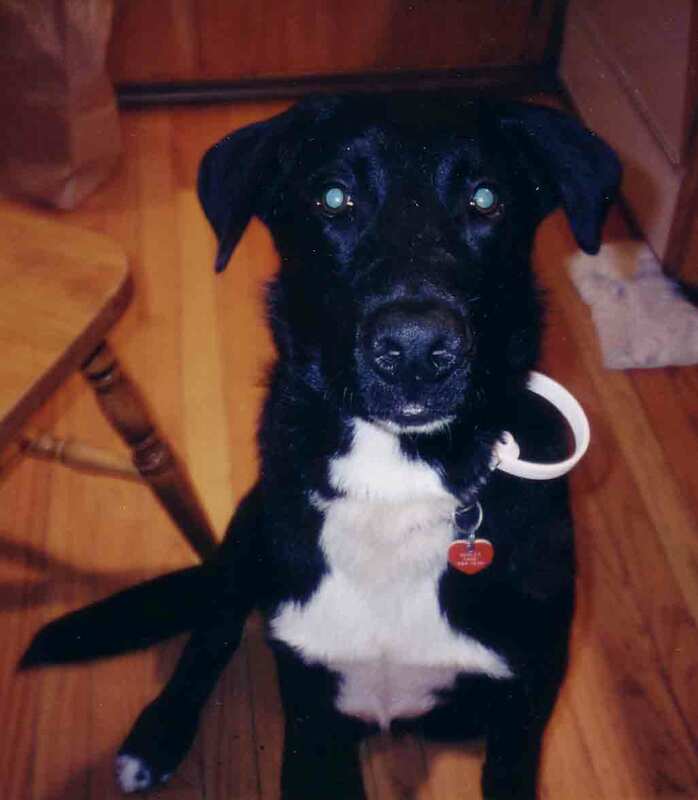 1.20.97 Harley ran away and I had to fetch him from Freedom Blvd. 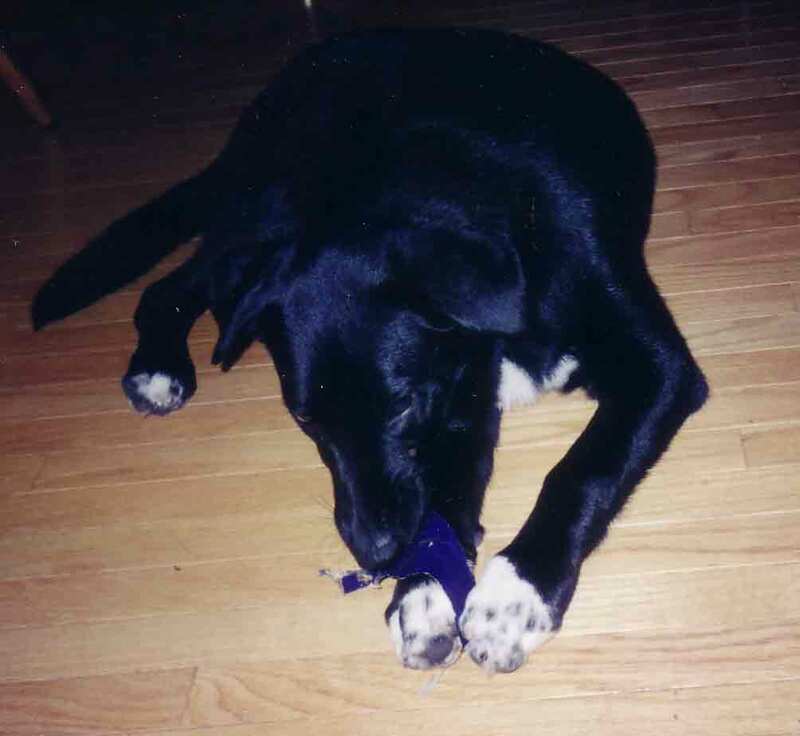 1.21.97 Put Harley's new electric collar on him and tried to show him where it would buzz, but HE KNEW already! 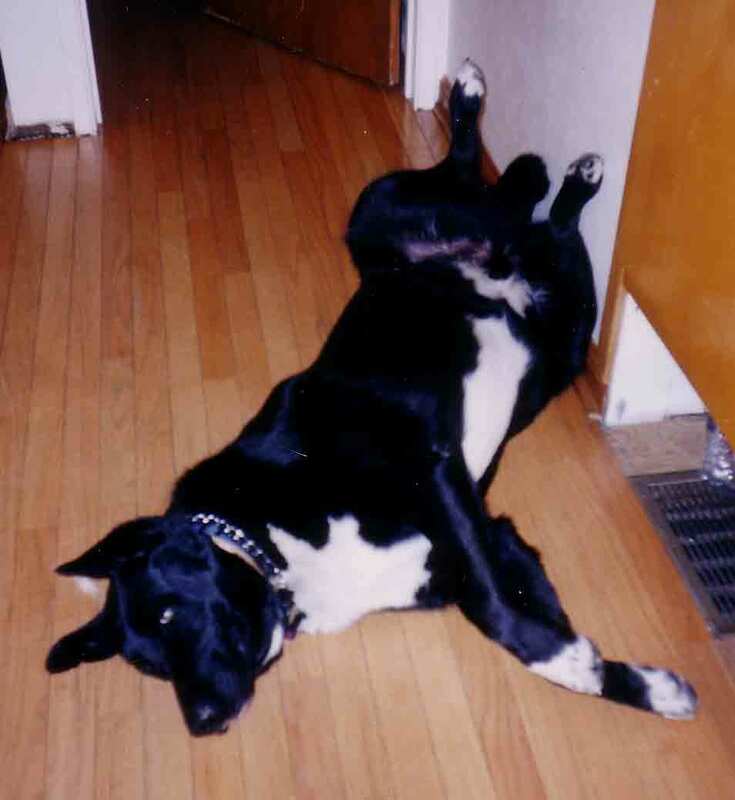 1.22.97 I thought Harley had run away in spite of his fence, but later found him sleeping in the garage. 6.22 I ordered sod, and tried to wire a motion detector to the sprinkler system to keep Harley off the lawn. 6.26.97 I found that Harley had completely dug up my new sod. Hennie and I replanted it, but it will surely suffer. Oh, I was mad at Harley! 8.2.98 An exciting night--Helen came down at 2:30 to tell me Harley was barking. I went out to investigate, but couldn't understand what Harley was upset about; he took me to a particular square foot of the orchard where I could see nothing. I came back in, and Helen went upstairs, only to let out a piercing scream and run downstairs: "There's SOMEBODY IN THE LIVING ROOM!" (It was Hennie). 8.8.98 Entertained Makato Tatsuta, his wife Michka, his children Umako and Mamako (ages 9 and 6). The children were frightened of Harley but enjoyed the rope swing, and eventually Umako made friends with Harley. (in his right rear leg). The vet says he weighs 145 and needs to lose 20 pounds. He has lost some. I should do the same! Michael: This is the earliest mention of his arthritis in the diaries. 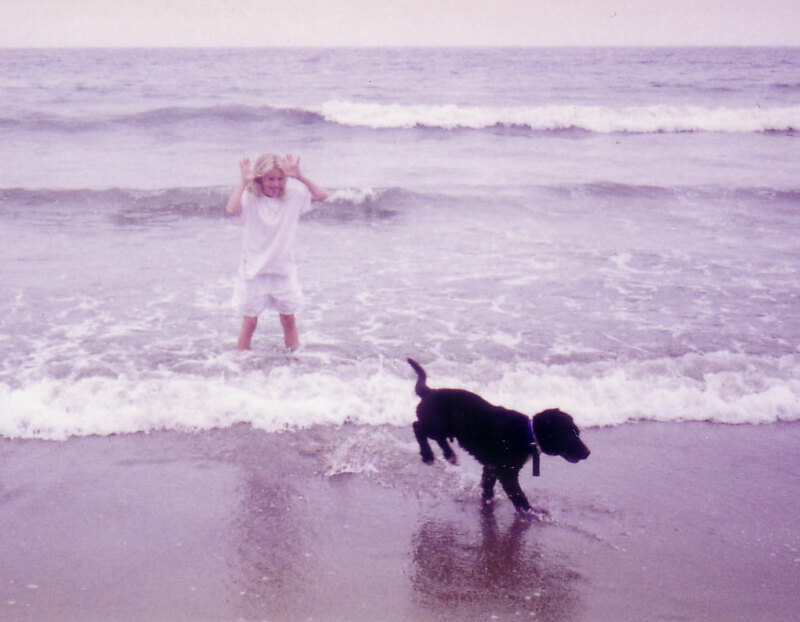 10.21.98 Took the dog to the beach. 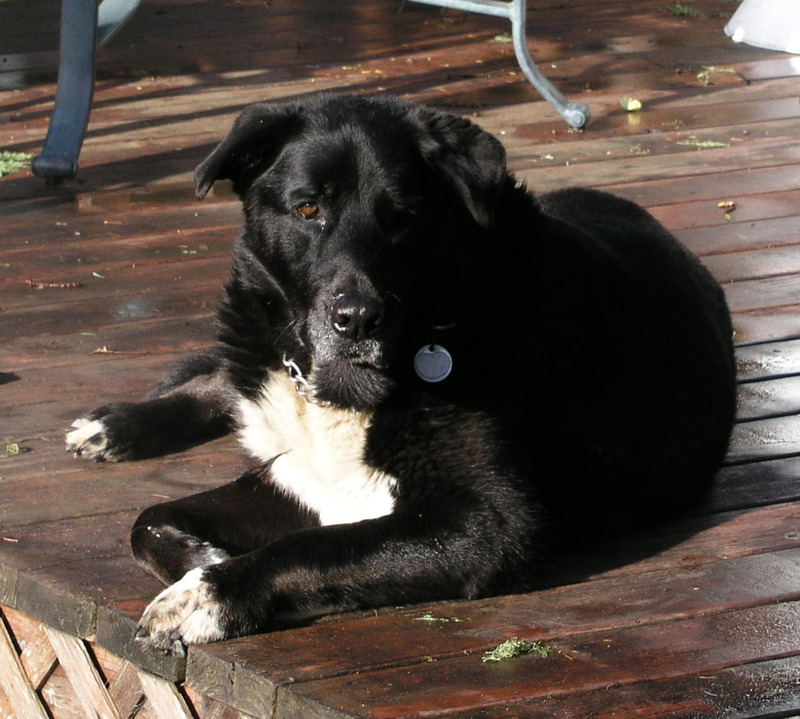 Harley's arthritis seems worse; he limped and needed a rest. 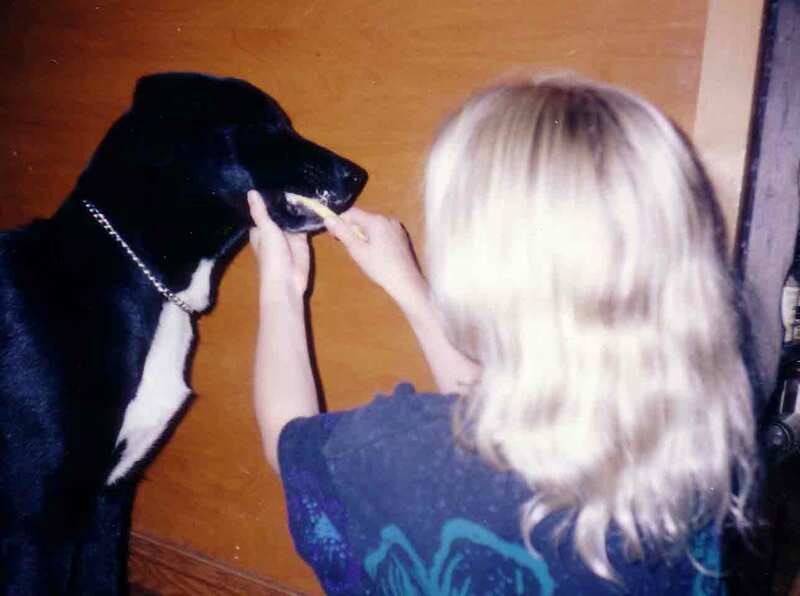 12.23.98 Took cookies to some neighbors and smoothed feathers of Sue and Steve about Harley's 1 am barking. 7.4.99 The fireworks were absolutely spectacular, a half-hour of stupendous pyrotechnics. I forgot to mention that in the afternoon on the Bay, the "tall ships" were having mock naval battles, firing 18-th century cannon at each other. (Not real cannon balls.) In between were ice cream and cafe latte. Poor Harley had to wait till midnight for his dinner, but he had a big and late breakfast, so he survived just fine. people were offended. Nevertheless we all had a good time. 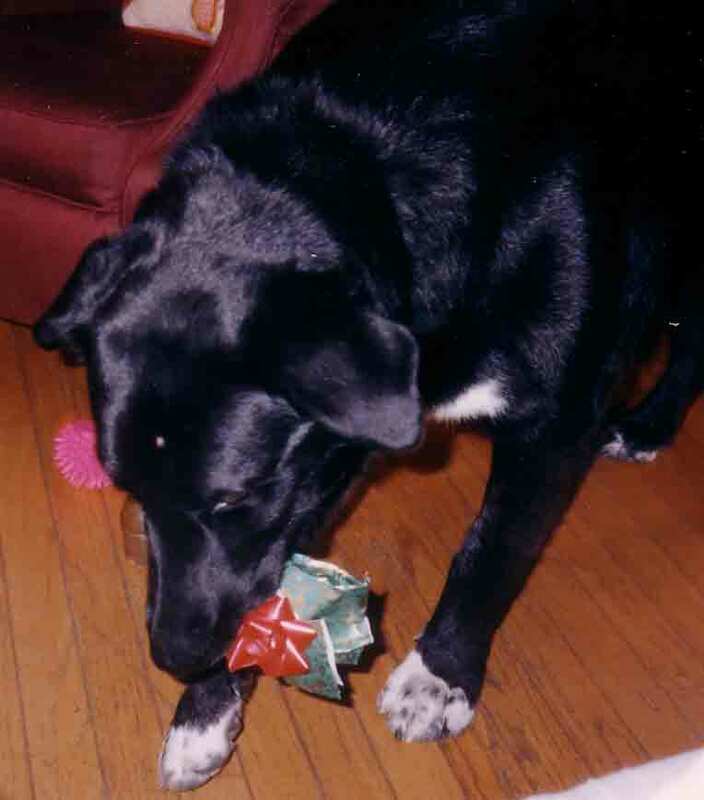 12.24.99 Harley received a Christmas present from "Alice the mail lady"--two dog biscuits in a red ribbon. Michael: Once the UPS delivered a package with a note to the delivery person: "Beware of dog HARLEY: will lick you to death!" almost well! But I guess he overdid it romping around the neighborhood. T 3.7.00 Harley has a large sore on his left cheek. To the vet: the vet said he needed to have it thoroughly clipped and cleaned. Anasthesia required. Total $436. This large sore is a "hot spot", caused by a bacterial infection that gets under the skin and eats away the skin. Now, Harley has to wear a plastic "lamp-shade" to keep him from scratching the sore. stay under supervision. He must keep this plastic lampshade around his head for two weeks! or so until the wound heals. Harley cried for over an hour. He is in pain and he is also upset about the lampshade. In the late afternoon, Hennie took him for a walk and he cheered up enough to stop crying for a while. 3.18.00 Harley got his "lampshade" off and has skin over the entire wound. Almost healed! 5.8.01 Harley to the vet--he's limping. Vet wants to do x-rays to rule out bone cancer and see if he has arthritis in his hip as well as leg. back; we had to get the car. I guess we walked him over a mile. 11.29.01 Harley has a lump in his side, about the size of a lemon. Robert discovered it. I will take him to the vet tomorrow. 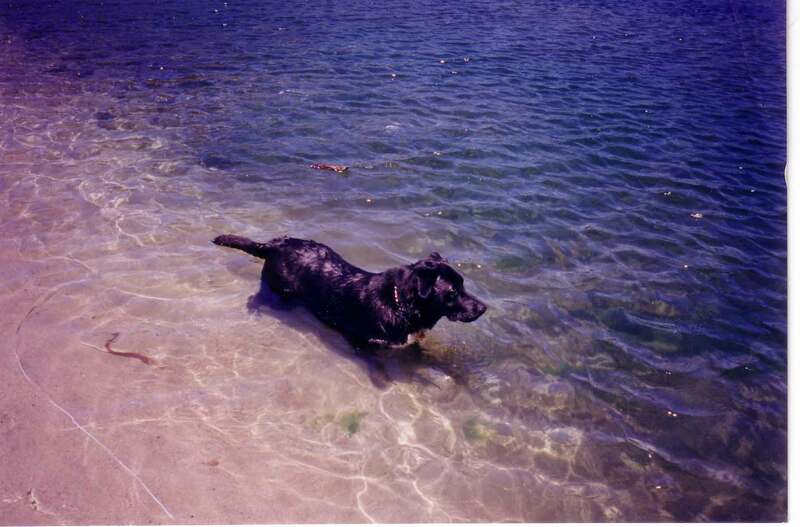 11.30.01 Harley to the vet, at emergency charges, and a lab test: it's just a lump of fat, not cancer. Hurray! 2.12.02 played my violin a little on the deck--the dog howled and moved away. Su 11.17 beautiful fall weather, walked on the beach with Hennie and Harley (today and yesterday). You'll see by the timestamp that I did get up to see the meteor shower, not at 2:45 but at 4:15. The full moon was pretty spectacular and was still high in the sky, so it wasn't nearly completely dark. I walked around in the driveway and Harley thought I was nuts. You've finally gone completely insane, he said. What the hell is going on, he said. Can't a dog get a night's rest? he said. It's my duty, I said. My daughter won't respect me as a person if I don't show some spirit of adventure, I said. Fine, he said, I'll go too. There is nothing like a dog. So we walked up and down the driveway and I saw some flashing lights, and asked him if he thought they were meteors. Maybe, he said. There were some pretty bright stars, and I saw the Big Dipper and Polaris, and thought about how far away the stars are and how short life is and how much I love my family and how lucky we are not to live in the Gaza Strip. Finally a meteor appeared, like a Roman candle, its glory dispelling all doubt: the previous flashing lights had NOT been meteors. Not real GOOD meteors, at least. I waited a while for an encore but none was forthcoming. So at least, I did see A METEOR! Harley went back in his doghouse and I am going back to bed. Su 9.28.03. Fletcher, the neighbor's dog and Harley's best friend, died Friday. Harley would be heartbroken if he could know his loss. 1.8.04 Walked Harley on the beach with Hennie--we went the whole distance we used to go when Harley was young, and he made it without limping. 1.10.04 Took down the Christmas tree; walked with Harley to the Polo Field and back, as in times of old--he can do it again! 6.16.04 Harley limped on his front legs for the first time tonight, perhaps because it was a strain jumping out of the car after yesterday's beach trip. Today we only walked him down the path to Shriya's.